I wont even bother complaining anymore!!! 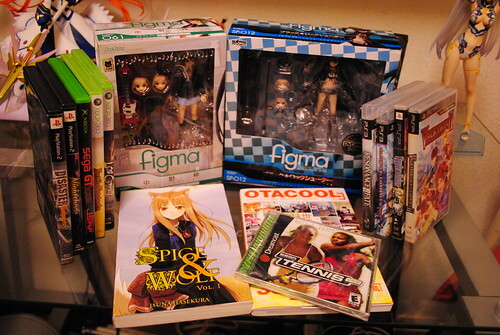 Instead I will just happily talk about my latest loot. 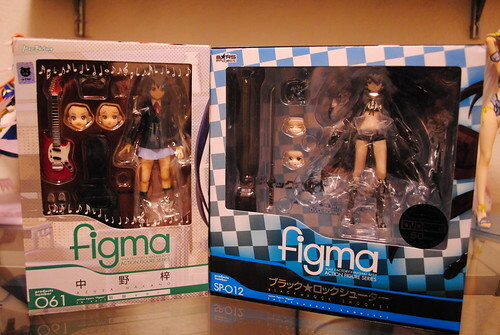 First up the figures, pretty light this time around with only two figmas. I'm happy to say my After School Teatime band is complete with the arrival of Azusa. Even if Mio and Yui kinda made me angry at their sudden sale at the beginning of the year. I don't particularly like BRS but I did enjoy the OVA and was pleased to see it included with the figma. Now why did I buy BRS? Simple, you can't have Black Rock Shooter without Dead Master and vice versa. 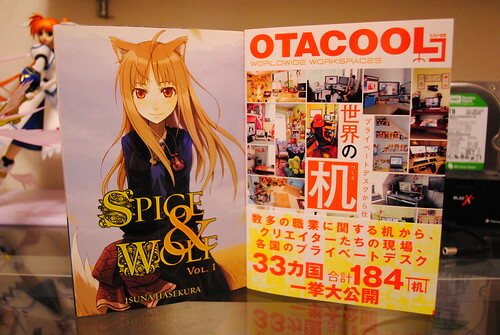 Technically I only got one book this time the third volume of Otacool since I had Spicy Wolf volume 1 for a while. Just kept forgetting to include it in the pictures. As far as Otacool 3 I liked this theme, workspaces around the world is pretty cool. Plus I got featured this time since unlike Otacool 1 and 2 I was able to participate. 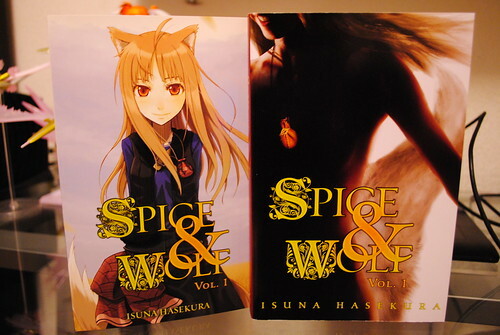 I didn't wanna buy Spicy Wolf at first because of that cover fiasco and what not. I ended picking up the second volume on a whim so I decided to buy the first too. Rightsuf had the dust jacket with the original artwork so I bought it in the end. I kinda wish it had been like the Haruhi novels, one version with the original cover and one with whatever the publisher wanted. I suppose the dust jacket approach is fine too. I do however, wish there had been consistency. First volume has the original artwork on the jacket and not the novel itself. For the second volume it was reversed, dust jacket with western cover and original artwork on the novel itself. I recently played through the story mode on BlazeBlue: Calamity Trigger and after becoming invested on all the characters and the cliffhanger ending I needed to play more. So, I went and bought Continuum Shift to continue the story. The sequel added gameplay tweaks, stages, modes, characters and a continuation of the story. I played it through and look forward to the next game as well as the new DLC characters. 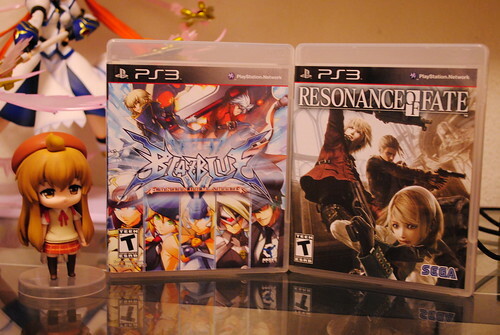 As far as Resonance of Fate I wanted to buy it since it was released but that month saw me buy Final Fantasy 13 and Yakuza 3 among other things making it not feasible at the time. When Amazon had it for half price I jumped the gun and bought myself a copy. On the Xbox side I picked up three games. I been hearing many good things about Lost Odyssey lately so I got it used for a nice $10. Game is pretty much new so not bad when I see it for $30. Battle Fantasia is a fighting game by Arc System Works, the developers behind Guilty Gear and BlazBlue. Although available on PSN I wanted a physical copy plus it was originally made for the Xbox 360 in the first place. 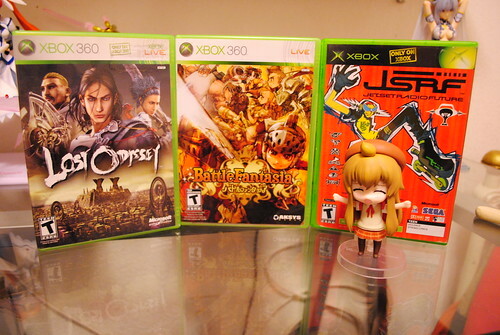 Ah, updates are nice, Jet Set Radio Future and Sega GT play just fine in my 360 unlike the one I tried them on before. Should pick up an original Xbox one of these days. For the PS2 I picked up Nightshade a spin off the well regarded Shinobi series from the Mega Drive/Genesis days. 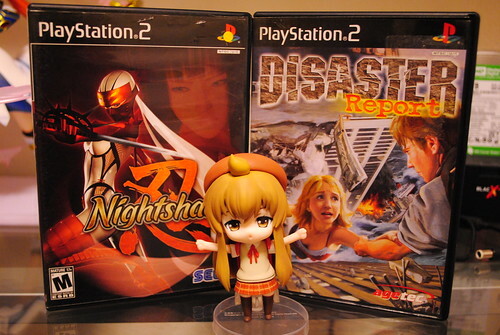 Disaster Report is this interesting game where you make your way through a city wide disaster as several characters. Interestingly enough the actions of one character affects the ones that come after them. This game has a sequel in the form of Raw Danger on the PS2 and an announced third game on the PSP. For the PSP I bought Valkyria Chronicles 2, sequel to the Valkyria Chronicles on the PS3. Just buy both games. The PSP version has all the well designed gameplay of the original plus several new additions. Yggdra Union originally released on the GBA and was ported to the PSP. Tactical RPG goodness on the go. 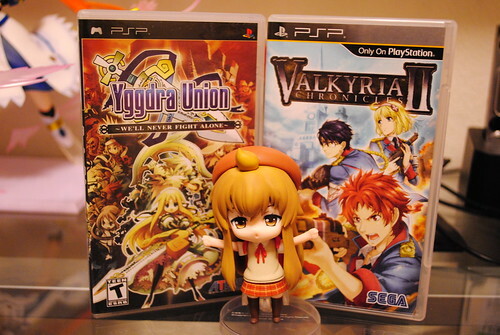 If you buy Knights in the Nightmare for PSP you can get Yggdra Union as a free PSN download. Finally, Sega Tennis 2k2. I see this pop up on worthwhile Dremacast games to play lists so I got it. For a buck, sealed. 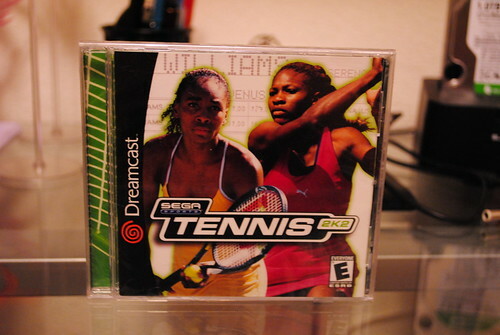 It's tennis on the Dreamcast, nothing else I can say. That's it for now anyways.